When suffering from sciatica pain it is best to understand the condition before seeking out treatment. Sciatica and the pain associated with it refer to the symptoms associated with pinched or compressed nerves root of the spinal cord. From top to bottom down the entire length of the spine, at each spinal level nerves exit through holes in the bone of the spine (foramen) on the right side and left side of the spinal column. These nerves are called nerve roots or radicular nerves. The sciatic nerve is an extension of the exiting nerve and anatomically runs down both legs connecting to tendons and muscles into your hip, buttock, thigh, knee, calf and foot. 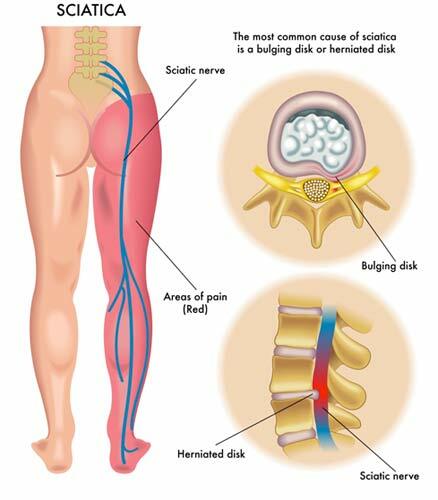 Sciatica can be present in one or both legs. Another common term used to describe this pain is radicular pain or radiculitis (nerve root inflammation). Radicular pain is usually secondary to compression or inflammation of a spinal nerve. This pain is often deep and steady and usually reproduced with certain positions and activities such as walking or sitting. When nerve dysfunction is documented the condition is referred to radiculopathy. Endoscopic Discectomy: The least invasive procedure and smallest incision in spine surgery today. An endoscope with HD camera is used to surgical visualize and remove the bulging or herniated disc material compressing the nerve root. The patient is under conscious sedation awake, aware and comfortable. Using this procedure reduces the risk of anesthesia, reduces post-operative pain and recovery. Endoscopic Foraminotomy: When the bony area around the exiting nerve becomes narrow (stenosis) bone spurs, ligaments, scar tissue or disc can cause the nerve to become compressed. Again, the endoscopic technique is used with special tools such a laser, motorized diamond burrs, ronguers, reamers and kerrisons to decompress the area around the nerve to relieve the pressure and symptoms.